Replenishment Feeding Level vs. Maintenance Feeding Level. 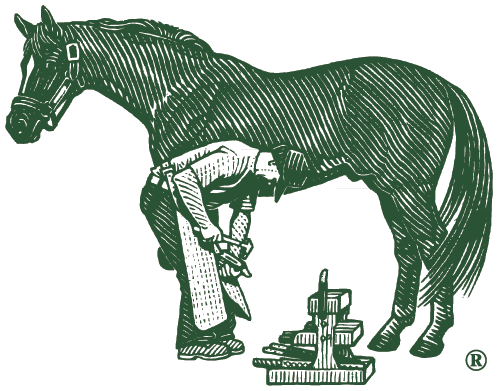 The length of time Farrier’s Formula® Double Strength should be given at the replenishment level is determined by the initial problem to be solved. With hoof problems, it is advisable to continue the Replenishment Feeding Level until the foot is completely remodeled (9 to 12 months), even though one will begin to observe denser hoof growth below the coronary band within two months. Feed intake can sometimes be reduced when feeding Farrier’s Formula® Double Strength. According to field reports feeding Farrier’s Formula® Double Strength allows the horse to utilise its feed intake more efficiently. Horses supplemented with Farrier’s Formula® Double Strength should be monitored for weight gain and, if necessary, the feeding amounts of grain, not Farrier’s Formula®, should be adjusted appropriately. Farrier’s Formula® Double Strength does not contain any added sugars or molasses, and the starch and carbohydrate content are very low. Combine Farrier’s Formula® Double Strength with Farrier's Finish® for Total Hoof Care. Farrier’s Formula® Double Strength provides the nutrients for healthy hoof growth from the inside. Farrier's Finish® destroys "hoof eating" microbes while maintaining correct hoof capsule moisture balance. Bran should not be fed to horses with poor hoof quality. Bran and other hull material of grain contain phytates. Phytates are high in phosphorus and can block the absorption of calcium and other minerals in the small intestine. Diets high in bran and other grain by-products can create the low calcium levels that are detrimental to hoof condition. Published scientific research (Kempson BSc, PhD 1987) demonstrated the ultra structural changes to the hoof wall caused by calcium deficiency related to the feeding of bran to the adult horse. There is little margin for error when supplementing selenium. A horse’s daily requirement for selenium is only a few milligrams less than the level of selenium that creates chronic selenium toxicity. A lack of copper in the diet increases the risk of selenium toxicity. There is no evidence or research that a selenium deficiency affects hoof structure. However, selenium excess and chronic selenium toxicities are well documented in the development of lameness, hoof defects, and poor hoof wall structure. Too much sulphur in the diet can be detrimental to hoof quality. Sulphur is an important nutrient for connective tissue strength and joint health. Farrier’s Formula® Double Strength contains the ingredient methionine (a sulphur containing amino acid) which supplies the correct amount of sulphur for joint and hoof health. Joint supplements often contain MSM, an ingredient that contains sulphur, and can lead to over supplementation of sulphur when combined with other products. Utilize joint supplements that do not contain MSM when feeding other sulphur containing products such as Farrier’s Formula® Double Strength.